A Contained Database is a database which contains all the necessary settings and metadata, making database easily portable to another server. This database will contain all the necessary details and will not have to depend on any server where it is installed for anything. You can take this database and move it to another server without having any worries. Now question raises about the user need on database to login. Contained Database is database that is no more depend on master database for logins. Contained databases contains the user details with database & database user work as login to connect. Once the contained database is moved, the users are moved as well, and users who belong to the contained database will have no access outside the contained database. 1) In Object Explorer, right-click a SQL Server instance, and then click Properties. 2) Select the Advanced page, and in the Containment section, set the Enable Contained Databases to True, and then click OK.
· From T-SQL : Run the following code on SQL Server Denali. This code will enable the settings for the contained database. 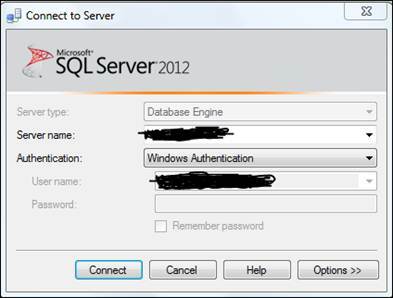 @username = N’user‘ : Name of a user in the current contained database that is mapped to a SQL Server authenticated login. The value is sysname, with a default of NULL. @rename = ] N’copy_login_name‘ | N’keep_name‘ : When a database user based on a login has a different user name than the login name, use keep_name to retain the database user name during the migration. @disablelogin = N’disable_login‘ | N’do_not_disable_login‘ :disable_login disables the login in the master database. To connect when the login is disabled, the connection must provide the contained database name as the initial catalog as part of the connection string. We will attempt to login in the database with default settings (Change the database : SSMS> Option > Connection Properties > Connect Database). You will notice that the login would be successful in the server. When expanded it, the user will have access to the contained database only, and not to any other database. · A user of contained database can gains the access of other database, if these databases have the guest account enabled. DBA or Developers both are habitual of using multiple SQL server remotely from one server. But the normal issue of running commands on wrong servers due to less of attention on server name displaying in SSMS query windows pane. We can give different color codes to different server to make them more identifiable in single look. I will help in closing careless mistakes & make query window identification for different server more handy & presentable. Once you have different color for different server in the status bar, it will be easier to notice the server against which they are about to execute the script. 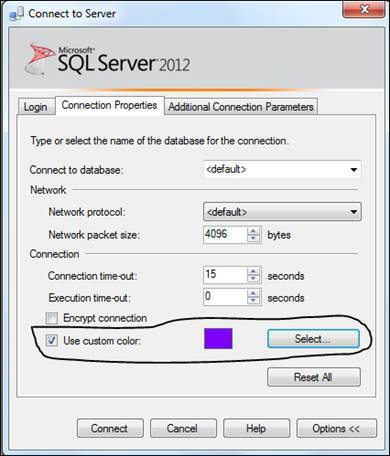 Microsoft SQL Server 2012 introduces 14 new built-in functions. 2 Out 14 explained below. · CONCAT : CONCAT takes a variable number of string arguments and concatenates them into a single string. It requires a minimum of two input values; otherwise, an error is raised. All arguments are implicitly converted to string types and then concatenated. Null values are implicitly converted to an empty string. 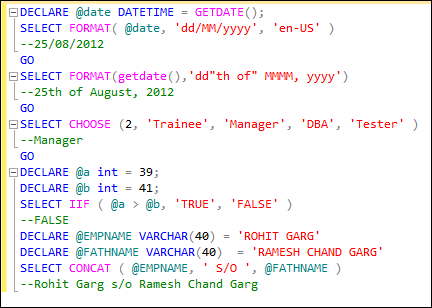 · FORMAT : Use the FORMAT function for locale-aware formatting of date/time and number values as strings. This really a good function because converting a date into desired format with convert along with format number is little uneasy. · CHOOSE : CHOOSE acts like an index into an array, where the array is composed of the arguments that follow the index argument. The index argument determines which of the following values will be returned. · IIF : It returns one of the two values depending upon whether the Boolean expression evaluates to either True or False. Microsoft SQL Server 2012 introduces 14 new built-in functions. 7 Out 14 explained below. 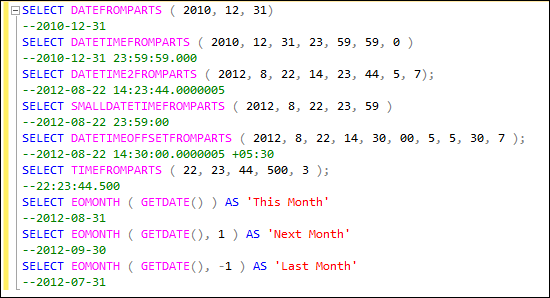 · DATEFROMPARTS : DATEFROMPARTS returns a date value with the date portion set to the specified year, month and day, and the time portion set to the default. If the arguments are not valid, then an error is raised. If required arguments are null, then null is returned. · DATETIMEFROMPARTS : DATETIMEFROMPARTS returns a datetime value. If the arguments are not valid, then an error is raised. If required arguments are null, then a null is returned. · DATETIME2FROMPARTS : DATETIME2FROMPARTS returns a datetime2 value. If the arguments are not valid, an error is raised. If required arguments are null, then null is returned. However, if the precision argument is null, then an error is raised. · SMALLDATETIMEFROMPARTS : SMALLDATETIMEFROMPARTS returns a smalldatetime value. If the arguments are not valid, then an error is thrown. If required arguments are null, then null is returned. · DATETIMEOFFSETFROMPARTS : DATETIMEOFFSETFROMPARTS returns a datetimeoffset data type. The offset arguments are used to represent the time zone offset. If the offset arguments are omitted, then the time zone offset is assumed to be 00:00, that is, there is no time zone offset. If the offset arguments are specified, then both arguments must be present and both must be positive or negative. If minute_offset is specified without hour_offset, an error is raised. If other arguments are not valid, then an error is raised. If required arguments are null, then a null is returned. However, if the precision argument is null, then an error is raised. · TIMEFROMPARTS : TIME returns a time value. If the arguments are invalid, then an error is raised. If any of the parameters are null, null is returned. However, if the precision argument is null, then an error is raised. · EOMONTH : EOMONTH Returns the last day of the month that contains the specified date.